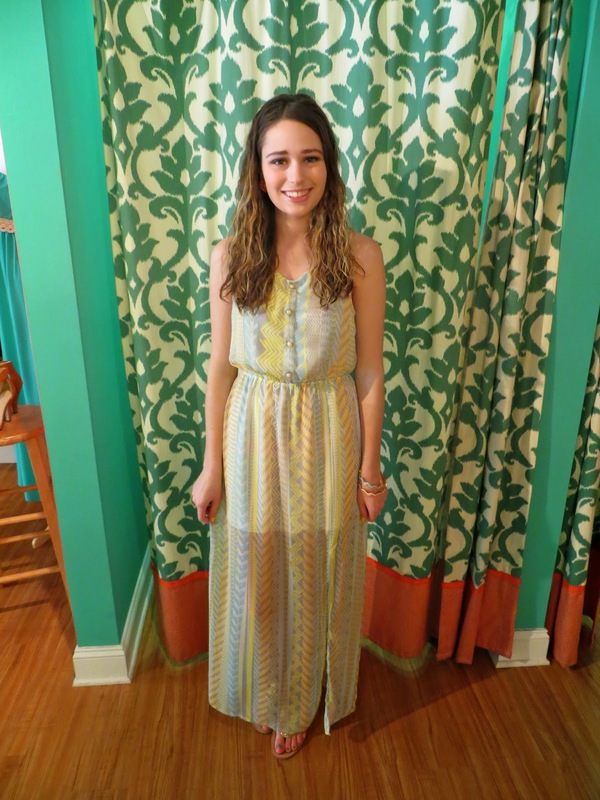 A fabulous Charlotte boutique: Vestique! Vestique has locations throughout North and South Carolina, and is very reasonably priced. 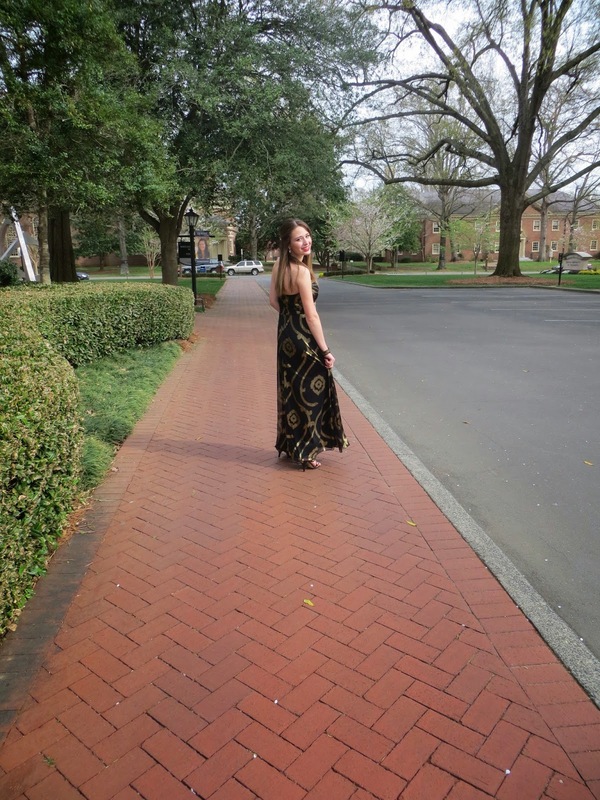 Many of the stylish outfits that my sorority sisters wear to our chapter meetings come from Vestique, so I knew that it was time that I checked it out for myself! The first thing that I noticed about the store was how bright and colorful it was! I absolutely loved the decor- if you know me, you know that I love color! I couldn't wait to start trying out some of the adorable clothes. I tried on three dresses which are shown below! Here is the amazing thing, all of the dresses are under $45! Can you believe that? I feel like those are lower prices than a lot mall stores would charge! The shoes that I'm wearing with dresses two and three are also from Vestique. I loved these dresses, especially the last one! But the item that I ended up falling the most in love with (and purchasing!) was the last item that I tried on. 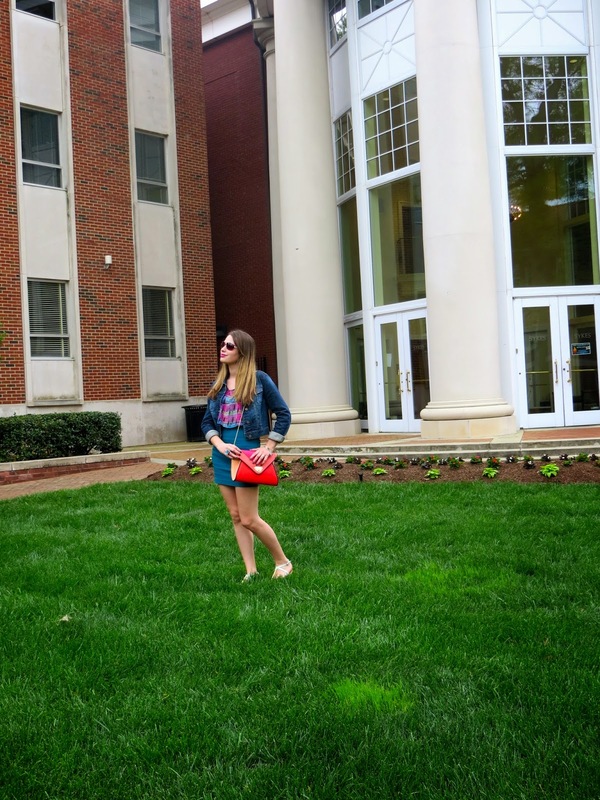 I'm not showing it on the blog today because I'm saving it for its own OOTD post! I will say that I absolutely love it, and I know that I'll be wearing it a ton for work this summer. Hope that y'all are having a great last weekend of April! Where did this month go?! 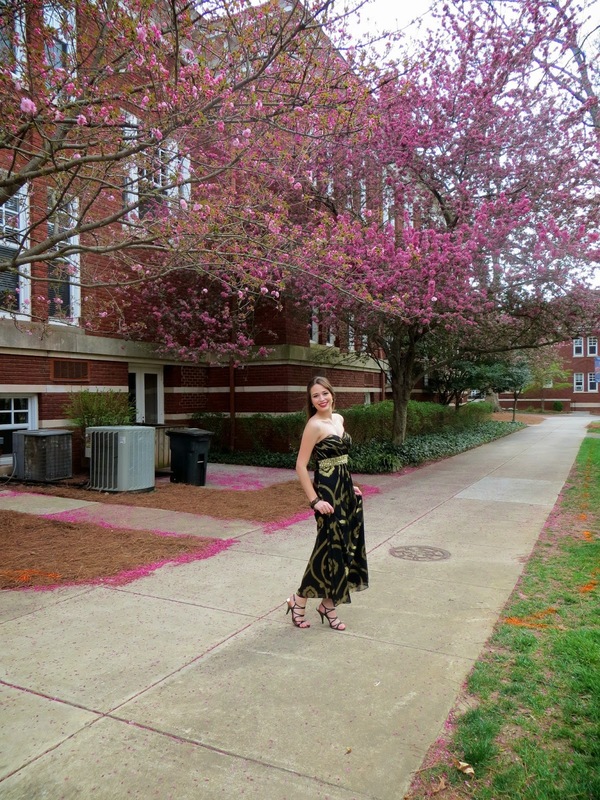 I am off to my former college tomorrow for their annual Spring Formal dance, and then spending the rest of the weekend packing up my dorm room and studying for my Monday exam! I like to think that once I make a big decision, I've made my decision. It doesn't mean that sometimes I don't go back and play the "Well what if I had chosen a different option instead?" game, but overall I usually accept the fact that I have decided something, and I stick with that even if I'm not happy with it. Well, all of that changed this week. Originally, I was supposed to spend this summer in Charlotte. I was going home for a couple weeks in May after my final exams ended, and then returning to my campus during Memorial Day weekend. My summer was going to consist of summer school, continuing at my internship and babysitting. (I would be doing summer school to try and get ahead with hopes of graduating a semester early.) I had thought these plans over for a long, long time, and seemed pretty content with them when I signed my summer housing contract in March. But after I signed that contract, I started to panic. I absolutely love going to college in Charlotte. It's a wonderful city to be an almost 20-something in. It's fairly safe, there's lots to do, and it has wonderful weather for the most part. But I couldn't picture spending my summer living in a dorm and taking classes and doing exactly what I do during the school year. I was also having trouble finding enough babysitting jobs to hold me over money-wise through the summer. I was hestitant to look for part-time jobs because if I was working at an actual business with a set schedule then I felt like I wouldn't have any free time at all between everything that I was doing!! I have my whole entire life to live far away, I want to take advantage of these special seasons at home while I still can! I have a feeling that this is going to be an amazing summer. My dad arrives in Charlotte on Monday night, and on Tuesday we start the big drive back home to Maine! Today I'm off to get my my car checked out and ready to make the big drive, and tomorrow night I'm actually headed out to my former college. 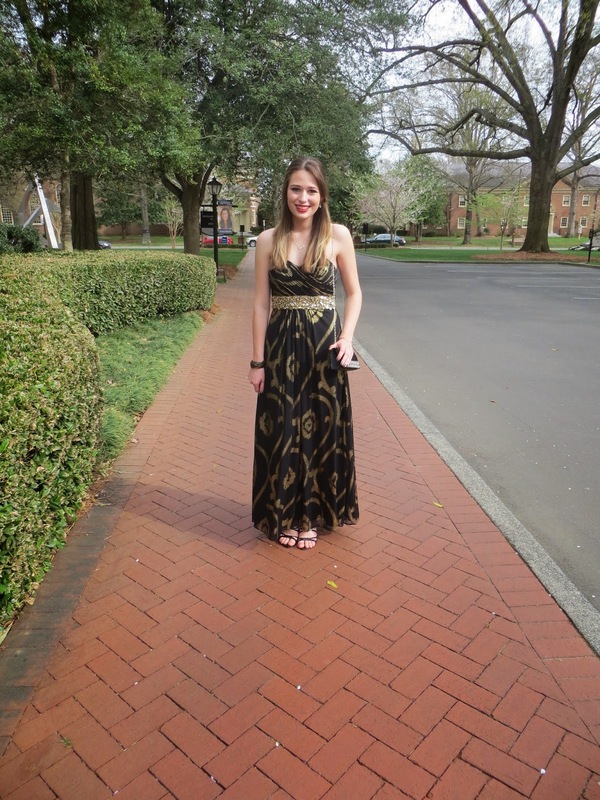 It's their Spring Formal dance and I'm going with my friend Ciera, since she came with me to my sorority formal! I can't wait to see all my best friends from there before I head home for the summer. And I can't wait to blog about what I'm wearing! Most importantly, since I made the decision to come home I have felt so much of God's peace!! I don't think that I prayed nearly enough about staying in Charlotte in the first place, and that's why I was experiencing so much anxiety- it wasn't God's plan for me! 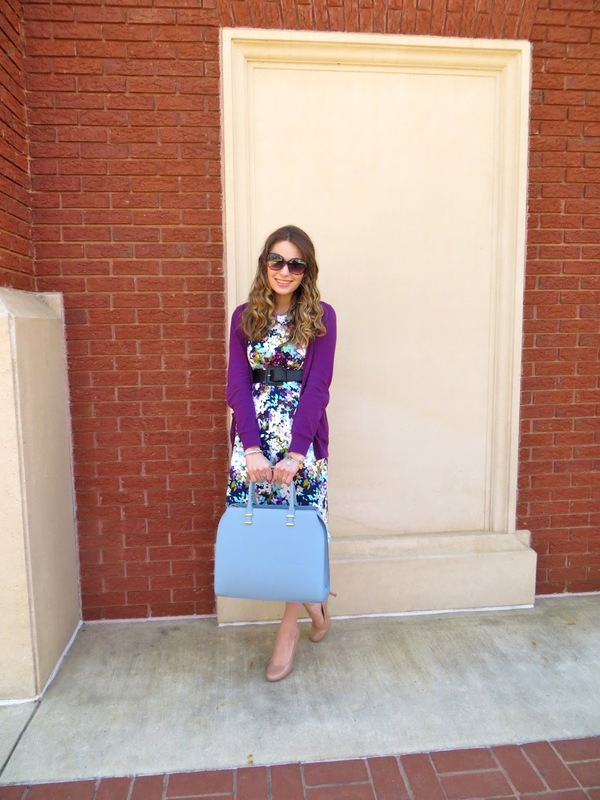 I am so excited to be working with Jet Chic Arm Candy today on the blog! Not only did I receive some beautiful bangles to style, but I am getting to give away one of their gorgeous bracelets to one of you as well! I received three bangles from the Jet Chic Etsy shop, and I had so much fun putting an outfit together around them! Since Spring is officially here and it's now past Easter, I am ready to break out my favorite white clothing. 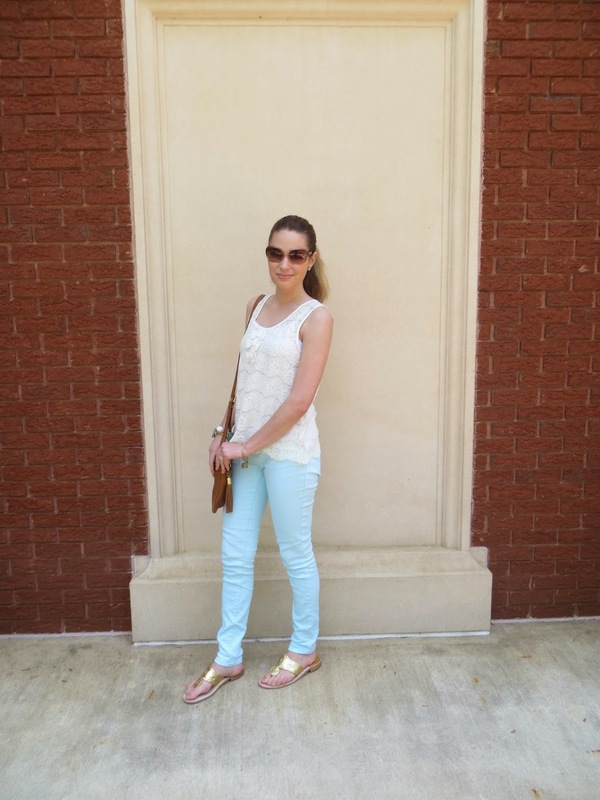 This adorable Forever 21 bow tank is a favorite summer top of mine! I paired it with mint jeans and my gold Jack Rogers sandals to match the colors of my bangles. Fun fact: this was my first time ever wearing yellow nail polish! My sweet church from my hometown in Maine recently sent me a care package, and they included this nail polish in it! I figured that meant I was destined to rock yellow nail polish. ;-) What do you y'all think? I'm actually kinda liking it for Spring! It adds a fun pop of color. Now for the part of this post that's most exciting to all of you: the giveaway: Jet Chic Arm Candy is giving away a bangle from their shop that's called the "Charlotte" bangle. 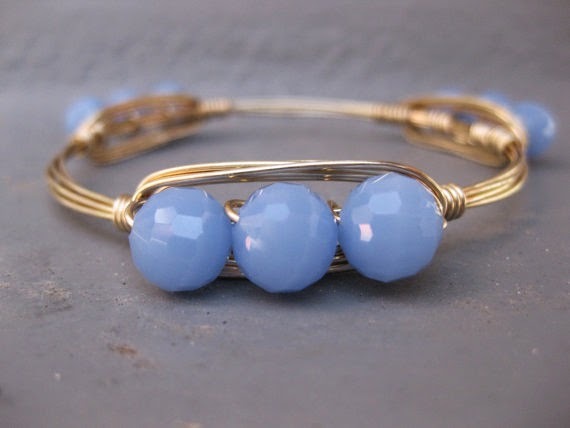 I specifically picked this bangle for the giveaway since I live and go to college in Charlotte (and tomorrow's post will actually be Charlotte related!). Isn't it pretty?! 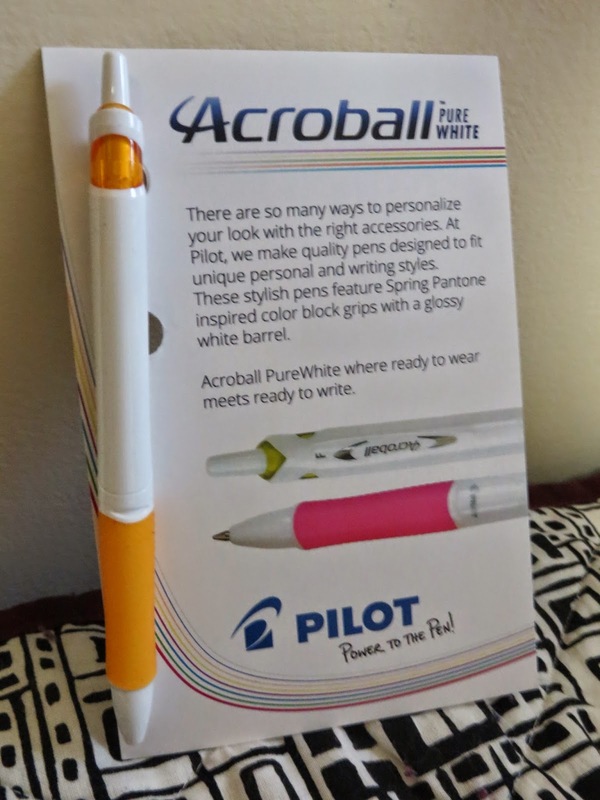 This giveaway will run until Monday, April 28th, 2014. Because this year's Easter was a bit late and fell so close to my final exams (and the three weeks that I'll be visiting Maine between this semester and summer school), I wasn't able to travel home for Easter weekend. My sweet friend Ciera from my former college and her family invited me to stay at their house for Saturday night and then to join them at their church for Easter services on Sunday! These OOTD pictures were taken quickly before we left for church, so I apologize if I look rushed in them! I got this dress on my trip to the UK back in December! 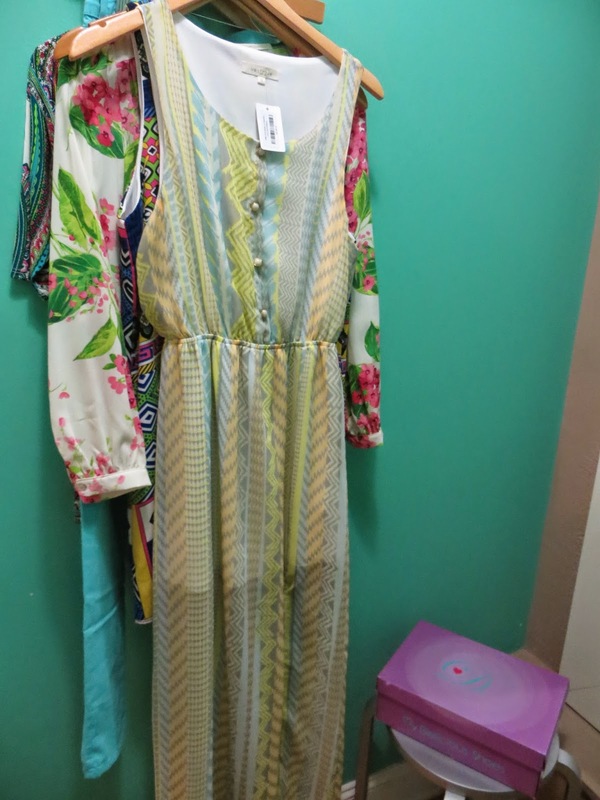 My mom and I found a bunch of adorable sundresses on sale in a little boutique on London's famed Oxford street. This is one of the ones that I brought home, and I have been saving it for Easter, which I'll admit has been hard! I love the colors and beautiful floral pattern of this dress, and I know that I will get much more use out of it in the future. Since this dress was so bold and bright, I kept my accessories very minimal. I really just wanted to let the dress speak for itself! I wore one large bangle bracelet in coordinating colors, and a simple pair of earrings. I didn't have any cardigans that matched the dress very well so I paired it with my favorite jean jacket. (And I'm glad I did that since church ended up being little bit chilly!) On my lips I'm wearing my favorite bargain lip product, one of my Wet N' Wild MegaLast Balm Stains! These lip crayons work SO well and are such a good deal! I have them in two shades and want to buy more. Even though putting together an Easter outfit is always fun, my favorite part of the holiday is remembering the real reason to celebrate, the fact that Jesus rose from the grave!! Easter is when He was able to prove that He wasn't just another prophet or wise teacher, He was actually God in human form. How amazing is that?! Easter is always a time when I love to listen to some of my favorite praise and worship songs, so I thought that I would end this post with a few of those!! And I can't forget that Easter also celebrates another favorite thing of mine: BUNNIES! 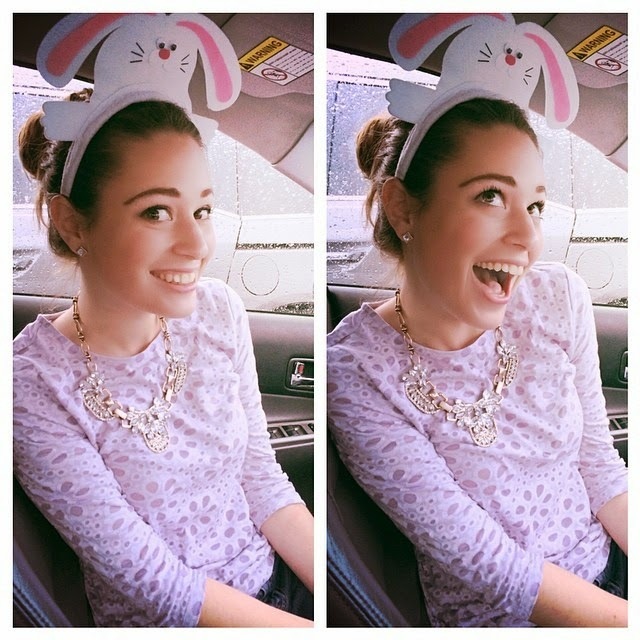 I found these adorable bunny ears when out running errands with Ciera on Saturday, and of course I had to model them in the car on the way back to her house! This was my last full week of classes for this semester. I can't believe that my sophomore year of college has almost come to a close! It's been a stressful past few weeks for me: both with the amount of things that I've had to do, and some things that have been going on for me personally. I will be sharing more about that next week! But I wanted a fun and light post since it's Friday, and I realized that I haven't shared a recap of what's been happening on my Instagram account in awhile! 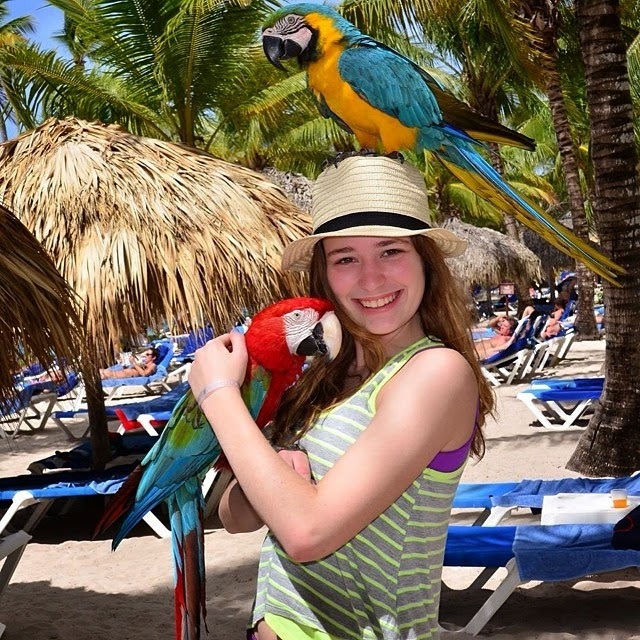 I was challenged by a friend in the Delight and Be Facebook group that I'm apart of to share a make-up free picture of myself on social media... so of course I had to pick one of my favorite pictures from my recent trip to the Dominican Republic!! :-) Aren't these guys just too handsome?! Greek Week at my college was a couple of weeks ago, so I tried to wear letters as many days as I could to be festive and show Greek pride! 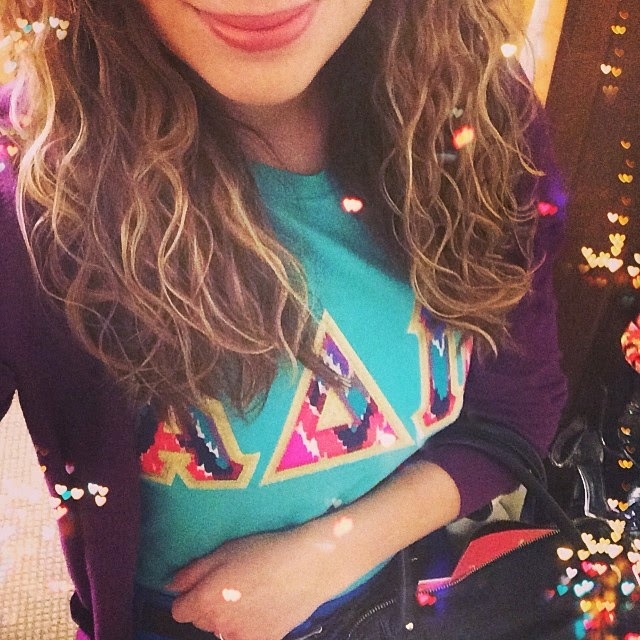 This is one of my favorite ADPi letter shirts. The letters are from the Lilly Pulitzer Hearts a Flutter print, and they were bought from Greek apparel company Jenna Benna. A close-up of some of the jewelry pieces that I wore to my sorority's Black Diamond formal! 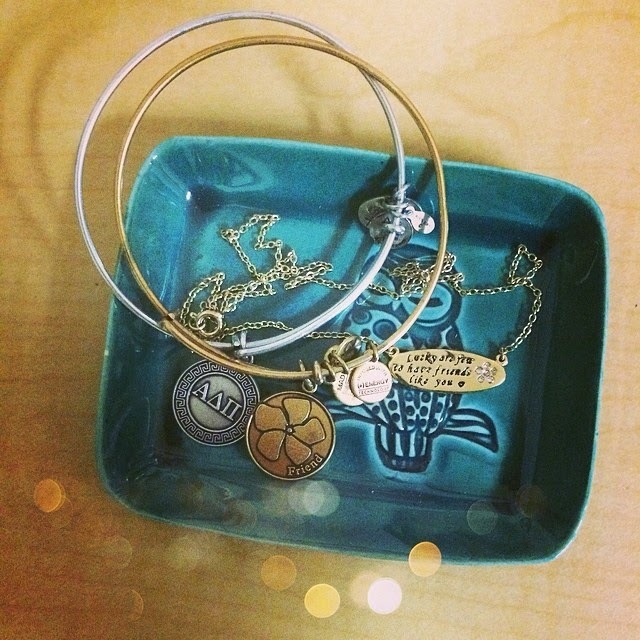 My two beloved Alex & Ani bracelets (that I wear in many of my OOTD posts and almost every single day!) and a dainty gold pendant. But the special thing about these jewelry pieces is that they were all Christmas gifts from my three best friends in Maine. The silver bangle is from Jules, my best friend from high school, the gold bangle is from Shara, my Maine bestie who I actually originally met online, and the necklace is from Katie, my childhood best friend from home!! In the weeks leading up to formal I was feeling really homesick and especially missing my best girlfriends from home, so I loved being able to incorporate gifts of theirs into my outfit! Recently Charlotte had some wonderfully warm weather! Last Saturday I was able to head to a lake for the day with one of the sweet girls that I intern with at the Ryan Seacrest Foundation. Once we got back to Charlotte we stopped for fro-yo! 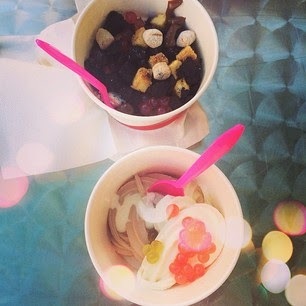 Charlotte has tons of fro-yo places so we decided to try one that was new to both of us: Cherry Berry. I thought it was delicious and would definitely go back! Lastly, sorority gals, have you entered my giveaway for a Greek lavalier necklace with The Collegiate Standard yet? You still have plenty of time to enter!! Here is my Instagram picture of my adorable lavalier. 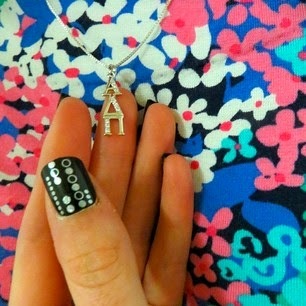 I paired it with a favorite Lilly dress (and the nails that came in my latest Influenster VoxBox)! 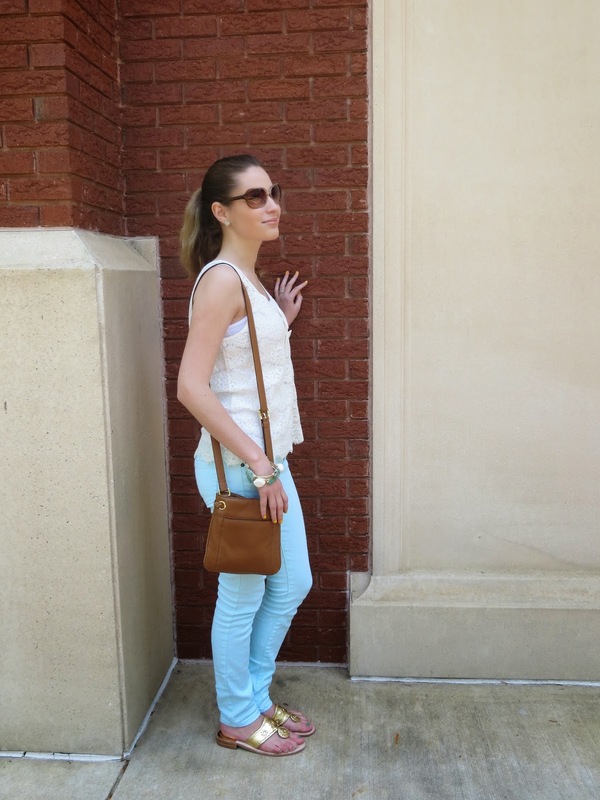 Blogger Nicole from Keeping You Stylish has quickly become one of my new favorite fashion bloggers! I love her fun and bright style, and like me she enjoys putting together outfits that are affordable and yet still chic! I've been wanting to collaborate with Nicole for awhile, and we were finally able to do something together. The theme of our collaboration is crop tops! This post is how I chose to style my crop top. Usually when I wear crop tops I only do so at the beach or pool because they are a bit more exposing, but I wanted to find a way to wear them so they would be appropriate for a school day! I was so excited once I was able to put this outfit together. This skirt is a bit high waisted so it took care of the stomach issue, and the colors seemed to match perfectly! I decided to go for a few accessories that added big pops of color. Hi, my name isn't Miss ALK. Why did it take me over three years to share that?! Well for starters, when I first started blogging back on my old blog, Confessions of a Maine Teenager, I was still pretty young. 16 to be exact. When I told my parents that I had started a blog, they still weren't really sure what that meant, but all they knew was that it mean that I had a public website. They were really concerned about my identity and privacy online since I was a minor, so they didn't want me to blog under my name. I didn't want to come up with a weird blogging nickname that sounded more like a weird chatroom username, so I settled on my initials with "Miss" in front of them. So Miss ALK I became! Back in high school when Lucy's license plates came in! Fast forward to now: blogging is now such a huge part of my life that all of my real-life friends know about my blog, and many are regular readers and supporters which means a lot to me! Many of my friends jokingly refer to me as Miss ALK now and that's become their nickname for me, and I love it. My dear friend Katie even crafted me the most beautiful plaque for my 19th birthday that says Miss ALK on it with flowers surrounding it, and now it hangs in my dorm room. Miss ALK has become an identity for me, and a very positive one at that. What many of you might not know is that when I started blogging I wasn't at a very good point in my life. It was the middle of my junior year of high school, and I was struggling with extreme anxiety and also some depression. I had recently gone through the loss of some friendships, and I barely had any self confidence. I dreamed of someday working in radio, but didn't think that I could ever make those dreams come true. I also never thought I could succeed at going to college out of state. Blogging has definitely helped me become a better version of myself. In the past three years, I have become more confident, happier and realized that I can make dreams and goals of mine come true! And my blogging name reminds me of that, which is why that even though I now share my real name in my social media accounts, I have continued to use my blogging name on my blog. OOTD: Got it from my Mama. I titled this post "Got it from my Mama" because I literally did get this dress from my mama!! She surprised me with it last week and had it sent to me directly from Landsend. 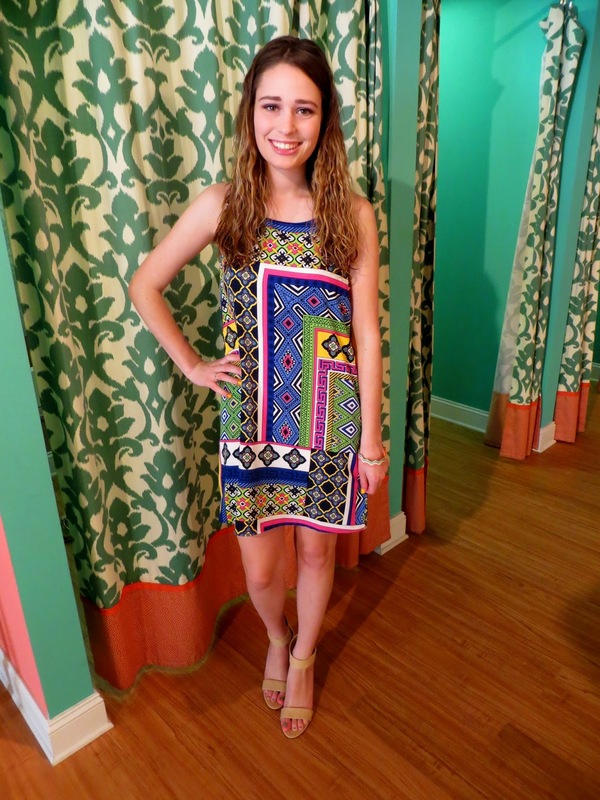 It's from their new summer catalog and it is the sleeveless ponte dress. It was so sweet of my mom to send this to me! I have had a really rough past couple of weeks, which is why I haven't been blogging as much. I am happy to report that things have gotten a lot better for me (and I'll be back to regular blogging next week! ), but this package was a nice pick-me-up when I wasn't feeling so well! I wore this outfit last Thursday when I interviewed a DJ from one of my favorite Charlotte radio stations! I did this for my final paper for my internship class at school. My wonderful boss at the Ryan Seacrest Foundation was able to set up the interview for me, and I am so thankful that she was able to do that!! I loved getting to visit a commercial station, and talk to an on-air personality. I become more and more sure everyday that radio is the right career parth for me! Hope that y'all are having a great start to your week! P.S. 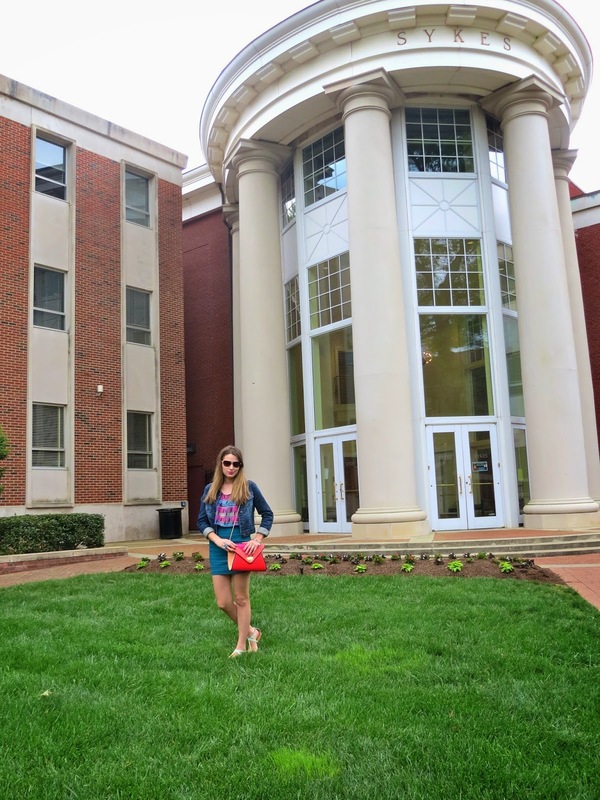 Sorority gals- don't forget to enter my Greek lavalier necklace giveaway!! 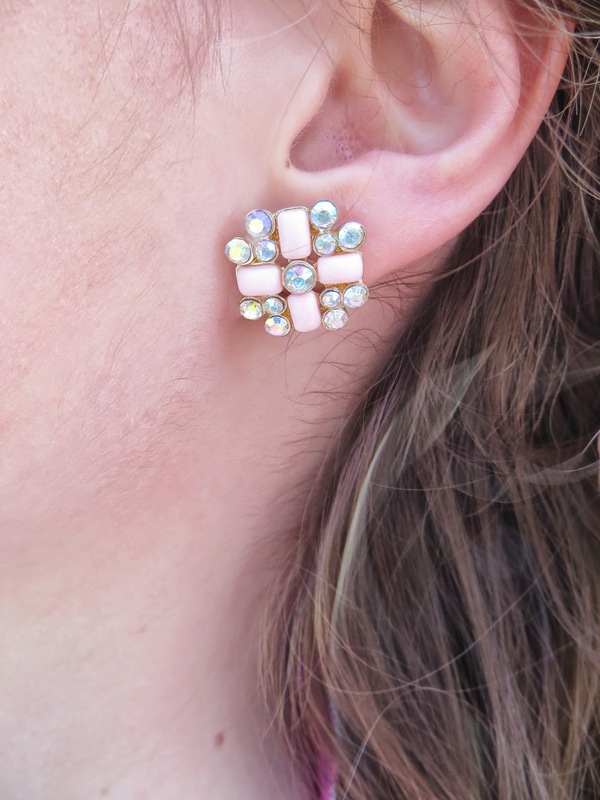 Giveaway: Greek Jewelry from The Collegiate Standard! 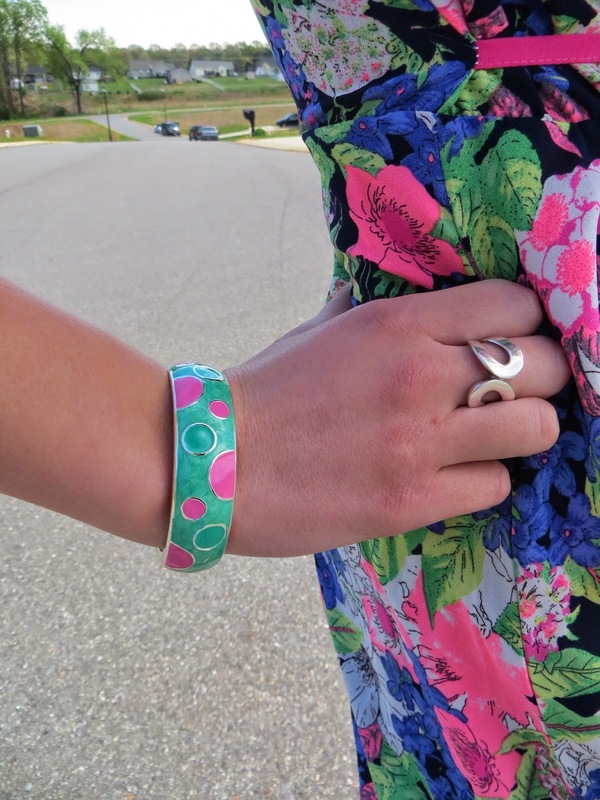 I was recently contacted by Linda from The Collegiate Standard, which is a company that makes beautiful jewelry for sororities, fraternities, and Greek honor societies! After looking at their Alpha Delta Pi jewelry selection, I decided to pick this beautiful lavalier necklace as my item to review. 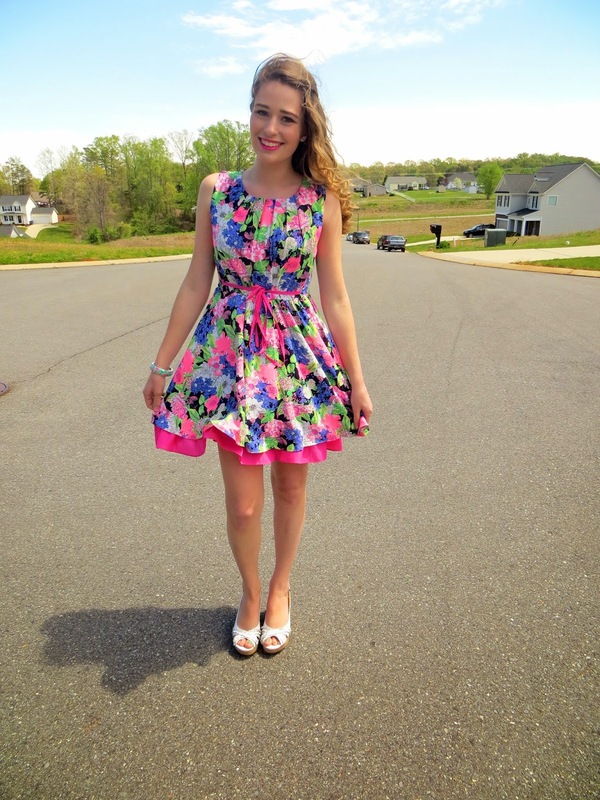 I wore it to church and a chapter meeting last weekend, and paired it with one of my favorite Lilly dresses! I just love my lavalier!! It is so delicate and beautiful. I already wore it to a chapter meeting last weekend, and I can't wait to wear it during all of the recruitment events at the start of school in the fall! Jewelry from The Collegiate Standard would be the perfect present for a Greek member in your life. I think that their jewelry would also be perfect gifts for Big/Little reveals! "The Collegiate Standard is an official Greek Licensed Jewelry company that caters to Fraternity and Sorority organizations. We provide the highest quality Greek jewelry and accessories at a reasonable price and commit to customer satisfaction with excellent service and a life-time warranty for all of our products. Created by Greeks, for Greeks!" "The Collegiate Standard has served over 50+ Greek Organizations. They love the Greek community! The Collegiate Standard is always willing to support Fraternities and Sororities in anyway like sponsorships, endorsements, giveaways, coupon codes, group orders etc. All their products are made in mind of a Greek." 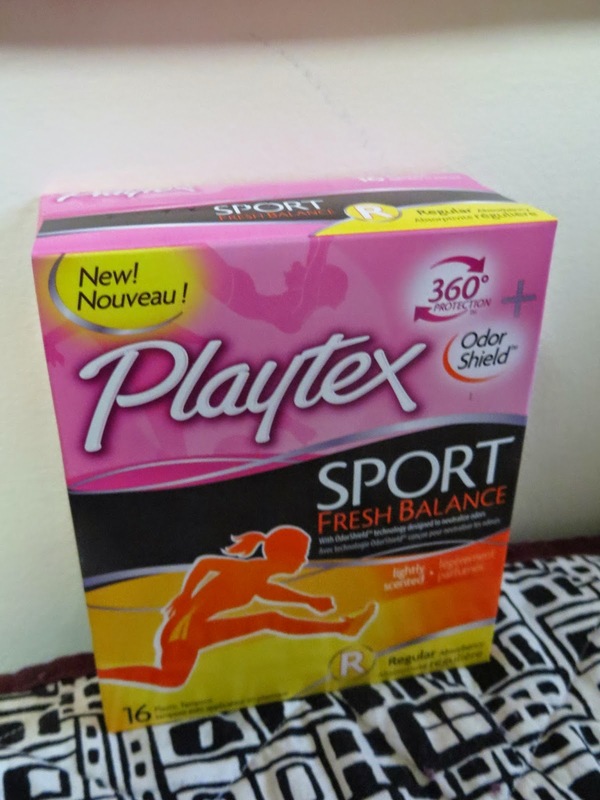 The Collegiate Standard has offered to sponsor a giveaway here on my blog!! This giveaway will run a bit longer than my normal giveaways- it will be up until April 25th, 2014. Stay tuned for a fun Spring OOTD post tomorrow! I am a member of a sample service review website called Influenster, which allows members to take surveys to review popular products. Members (who are called Influensters) are then rewarded by receiving VoxBoxes in the mail, which are fun boxes filled with all sorts of awesome samples, and you get them completely for free! I was a recent recipient of Influenster's UniVoxBox, which was sent out to college aged Influensters. I absolutely loved the items that I was sent, and I wanted to share them with y'all! I kept trying and trying and for some reason this picture wouldn't upload in the right direction!! Ugh. 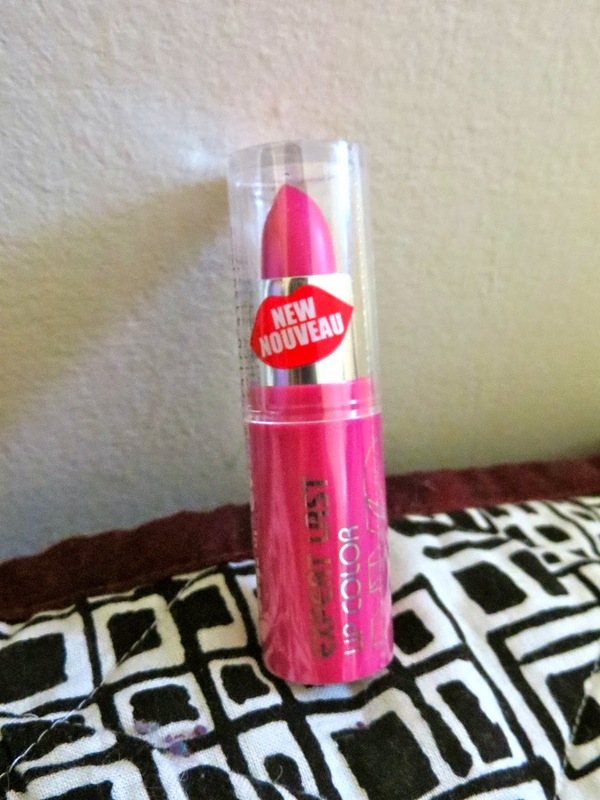 NYC New York Color Expert Last Lipstick in Forever Fuschia: I was really excited about receiving this item since y'all know that I love trying new make-up!! I hadn't previously tried much from the NYC line, so I was interested to see what their new lip products were like. I was very impressed with the staying power of this lipstick!! For a lip product that only cost a couple dollars, it felt surprisingly comfortable on my lips and lasted several hours. Influenster sent me the shade Forever Fuschia, and goodness is this shade bright! It reminds me a lot of MAC's popular Candy Yum Yum shade. I think this color was a bit too bright for me for everyday where, but it would be perfect for an OOTD post or a fun night out! I'm also excited to try other colors from this NYC lipstick line. Rimmel London Stay Matte Foundation in Light Ivory: I was pleasantly surprised by this foundation! It has a very thick consistency, and a little goes a long way! It provides what I'd call full coverage, and I think this is something I would repurchase! The only thing that I didn't like was the shade. I was sent a shade called Light Ivory, and I think it might be slighty too pink for my skintone. But other I like the foundation itself a lot, and I would call this a good drugstore buy! Red Rose Real Tea Premium Water Enhancers in Black Currant Raspberry: Red Rose is just the lastest brand to release water enhancer drops. These tea drops come in a little bottle, and you're supposed to squeeze a drop or two into a cold or hot glass of water, depending on if you want hot or iced tea. I'll start by saying that I'm a huge tea fan. I love tea and drink it all the time, so this water enhancer that claimed to be tea had high expectations to beat! I was pleasantly surprised though at how tasty at was. I really liked the black currant raspberry flavor. I used this as a hot tea, but I would also like to experiment with how it would taste iced. 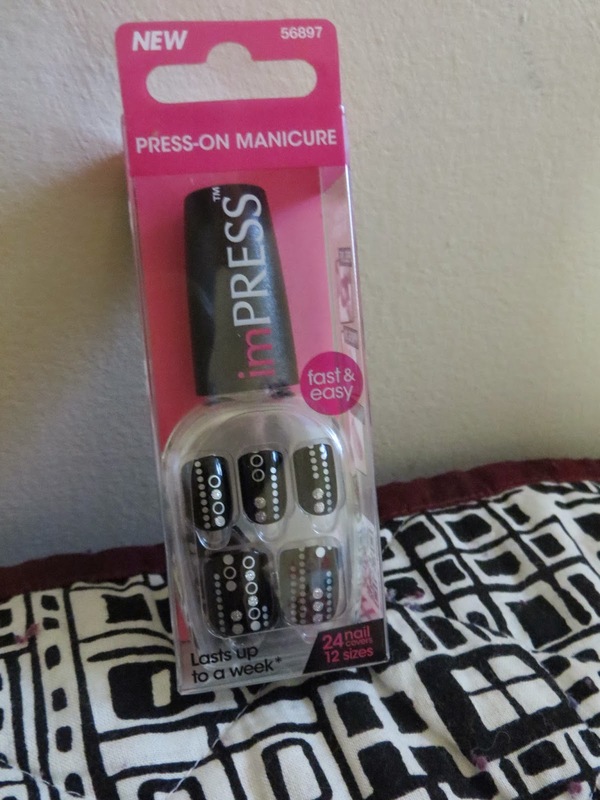 Broadway Nails imPRESS Manicures: This was my favorite item in the voxbox!! I wore these nails to my sorority formal last weekend and got so many compliments on them! One of the main things that I loved about them is that they are fake nails, but they don't come with the expense of having them done at a salon, or the nastiness of the glue that comes in most DIY acrylic kits. These come with a thin adhesive already built into each nail, so you just press and go- it's really that easy! Mine stayed on for two days before falling off, and that was honestly longer then I expected. And when they fell off they didn't destroy my real nails underneath or leave any residue, they just came right off! LOVED this product and I will be repurchasing them for another formal event that I'm going to at the end of the month! Are any of you Influenster members? Did you receive the UniVoxBox or another recent box? Getting my priorities in order. It's been a very rough week for me in my personal life. A lot of disappointments and unexpected stressors, as well as a few bad surprises. I realized last night after many tears that I really need to take a few days and focus on myself, school and spending time with the Lord. My attitude hasn't been the best for dealing with the things that have come up lately, and I realized that I have hit my breaking point, and I really need to spend this week to work on myself and immerse myself in my faith. My anxiety hasn't been this bad in a long time, and I want to stop it now. I decided not to get my hair done at a salon. Instead I straightened it and pulled a little bit of it back. I think this was the perfect look for this dress, and I also got to save money- win win! My accessories came together in an interesting way: some were things that I'd had for years, such as my floral ring (a gift from my grandmother) and the black bracelet, and other things were newer and bought for this event. Here are some other pictures from the night! Ciera, my best friend from my former college! She was my guest and "date" for Black Diamond. Black Diamond was a very elegant event, and I loved seeing all my sisters dressed up! The event was held at a beautiful estate home in Charlotte. I am already looking forward to next year's event! 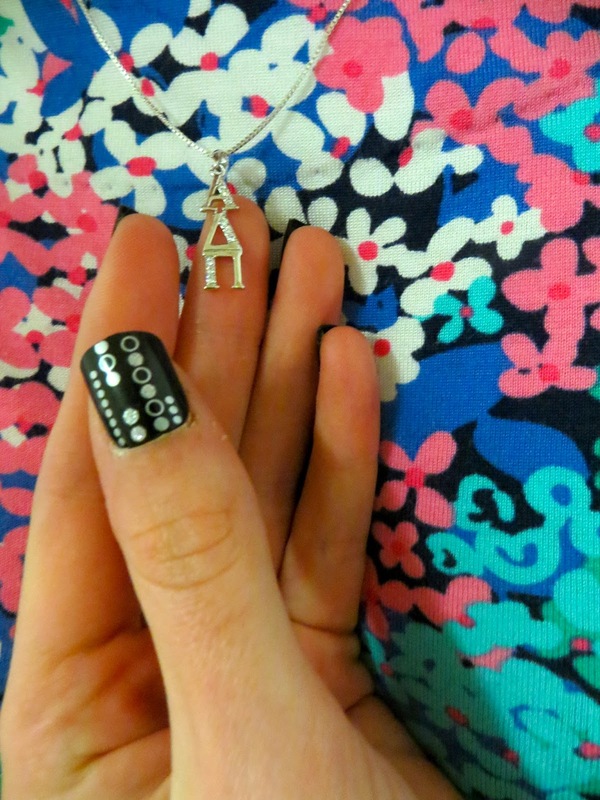 Speaking of sorority stuff, stay tuned soon for a review post of a wonderful company that sells Greek jewelry!